I was a bit startled this morning when I opened The Photographer’s Ephemeris on my computer to check on the time of sunrise. The Ephemeris is a cool app (free for the desktop, small charge for smartphones and tablets: www.photoephemeris.com) showing not only times of sunrise, sunset, moonrise, and moonset, but the compass direction (azimuth) that each occur at, from any location. Thus the savvy landscape photographer plans his/her shoots. 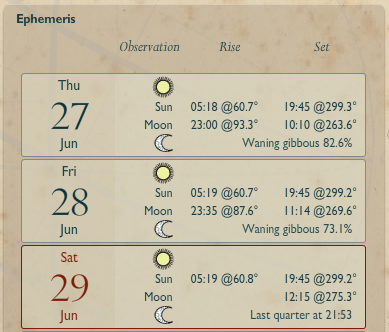 Photo Ephemeris map: no moonrise! 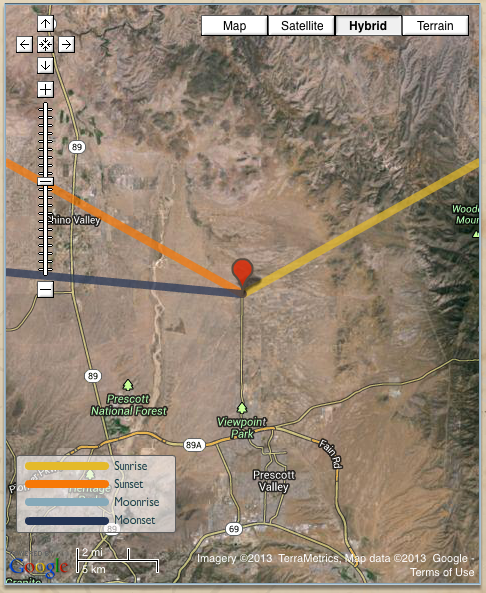 It has yellow and orange lines for the direction of sunrise and sunset, respectively. Light blue for moonrise, dark blue for moonset. But this morning: no light blue. What? And no moonrise time on the chart to the right of the aerial photo/map. Why? Because the moon had already risen, about a half hour before midnight. So technically it rose yesterday, very late yesterday. I knew the waning moon would not be worth shooting as part of a landscape scene again for a couple weeks anyhow, since we are at Last Quarter, midway between Full Moon and New Moon. I just like checking out sunrise times, etc. in the meantime. The good news: tomorrow we’re back to two-a-days again, both moonrise and moonset. 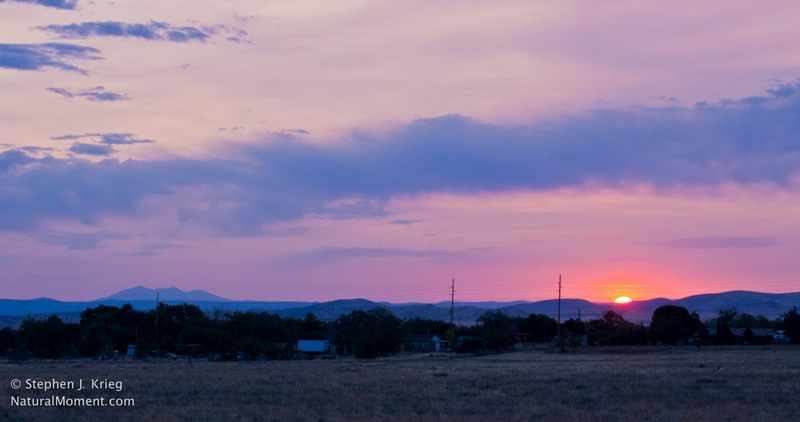 And the sunrise this morning over the Black Hills of Arizona’s Yavapai County north of Prescott wasn’t bad, either. 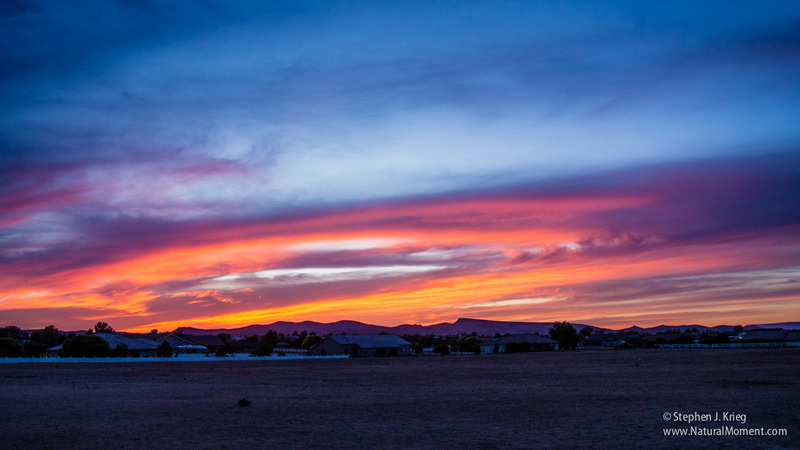 Another Arizona sunset. I’d thought the clouds were too low on the horizon, that they would cut off the sunset afterglow colors. But as the clouds lit up with evening fire, a hole became apparent. It was a circular sunset! Sweet. “Never assume”. Photo Location: Little Chino Valley, north of Prescott, Arizona. Camera: Olympus Pen E-PL5. Lens: Yes. Post processing in Adobe Lightroom 4. Clouds make the sunset. If it’s a clear sky, the sun is just a little orange ball sinking out of sight below the horizon. Too many clouds on the western horizon cuts off the sunset afterglow colors. But it doesn’t take many of the right kind of clouds, well positioned, to dramatically enhance the colors. Here, only a few cumulus clouds are on the horizon, but just high enough to leave a gap above the distant mountains, so that the sun’s rays aren’t cut off from the sky above. 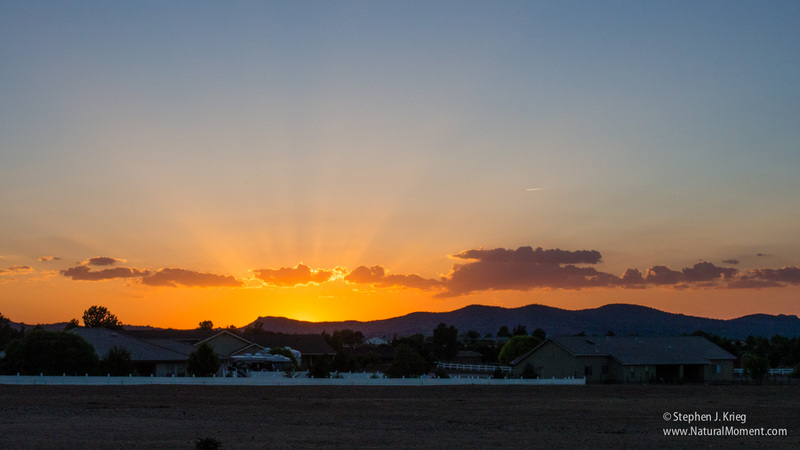 The clouds reflect the warm colors of the just-set sun and, in this instance, even spread it out into rays. Photo location: Little Chino Valley, Yavapai County, central Arizona highlands. Elevation 5,000 feet. Camera: Olympus Pen E-PL5, shot in Camera Raw format, post processed in Adobe Lightroom 4 for control over the values, such as contrast and shadow detail.